Above: Opening night this year held on the banks of the Todd, featuring a free community screening for the world premiere of Night Parrot Stories. This photo and those below by Anna Cadden & Rusty Stewart. The inaugural Something, Somewhere Film Festival, held in Alice in early May, sold out in every session, but that’s the last thing director Alex Kelly mentions when I ask her about the festival’s success and its future. That’s because both are about so much more than “bums on seats”. She and her colleagues, Matt Woodham and Anneke Rose, wanted to engage the audience by films that were talking to their lives, that would start new conversations, not with a view to everyone reaching agreement, but to “building literacy around issues and growing in our understanding of how we see ourselves and our place in the world”. That’s a big ask of a four-day program, Kelly admits, but the ambition is to grow the event in scope and depth over the years. 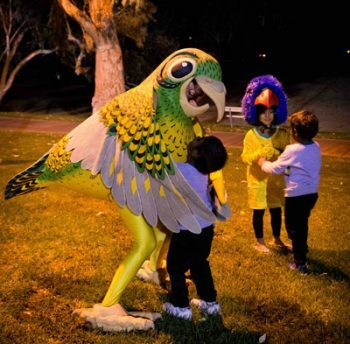 Left: Something for everyone, children loved meeting the Nigh Parrots (thanks to Kaye Kessing’s wonderful costumes). The trio have already begun to watch films for next year’s program. Their interest is mostly in international documentary that highlights or parallels things that are happening here. “Alice is so rich and diverse, there are lots of national and international contexts that have local echoes,” says Kelly. They might see a film they love, but if it lacks local resonance they won’t choose it. For example, for this year’s program they saw strong films about criminal justice issues for black Americans, which at first take seemed to be locally relevant but on reflection were not. Neither did they find the right films about fracking and transgender/queer identity that they felt would make strong connections with local audiences. Other curatorial criteria also came into play. They wanted at least half the films to come from female directors, responding to national and international campaigns on this cultural equity issue. They were also leaning towards directors who were people of colour, and / or were from developing nations, and /or were people with a disability, who had made films that hadn’t screened locally, and were not likely to, and that would sit well with one another in the same program. Right: The local connections were made explicit by ‘community respondants’ to each film. 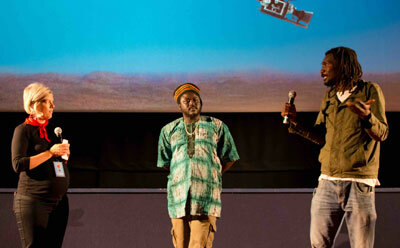 Here local musician King Marong (Gambia) and filmmaker Ahmed Adam (Sudan), in conversation with Alex Kelly, respond to the film Beats of the Antonov. Programming, however, is not the only task ahead to help the festival take root as a homegrown annual event. The trio want to develop more local partnerships, not only for funding support, but for building trust with the local audience and enriching the festival’s context. Kelly says they have already had interest from interstate and international film-makers wanting to get involved next year, but they won’t be rushing into this. 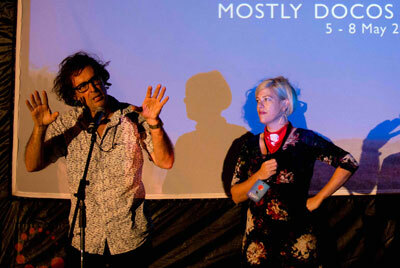 Left: Film-maker Robert Nugent on stage with Kelly at the screening of Night Parrot Stories. I don’t know if my film Night Parrot Stories is good or not, but of course the experience of the film in the minds of the audience and my own feelings can never be the same. Yet there is a distinct feeling of magic in the communion that has been created by Night Parrot Stories that evening on 5th May 2016 in Alice Springs, at the start of the inaugural Something Somewhere Film Festival. The festival, and its location, has all the ingredients that could make it a national cultural icon, and an international fixture for filmmakers and audiences. A great film festival has at its core a spirit that goes beyond merely screening films. While there are many travelling film festivals, curated from afar and imported as a pre-formed package with pre-formed publicity, the Something Somewhere Film Festival rose above such feral offerings. It was created locally and organically, but with a global outward looking perspective. Here, in the presence of filmmakers, films were introduced, and discussions facilitated. An audience was created that was more than the sum of tickets sold. There were interactions with fellow film-goers, and events that went beyond the screenings, that created a buzz and an excitement. The audience and the filmmakers participated in an event that had collective meaning and enchantment. It was in Alice Springs, the centre of Australia. An outward looking place and an international destination. There is a history of coming together in such a place and creating something anew, and the Something Somewhere Film Festival captured that spirit and amplified it.